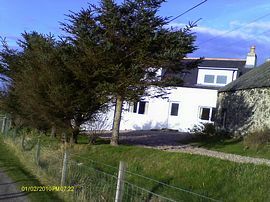 The B&B is situated in the tiny coastal hamlet of Farr, by Bettyhill. The house offers spacious en-suite accommodation, a cosy comfortable guest lounge with SkyTV (+Sports! ), wifi and mobile reception. Your host is an ex-chef and is happy to provide a (pre-booked) evening meal, or to supply a supper tray for those who just pass by. All are welcome to bring their own alcohol. There are several places to eat within one mile of the house. 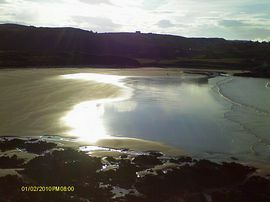 The stunning white sands of Farr Bay are a ten minute walk over the fields, and the scenery from the house and gardens is breath-taking. Take your breakfast looking out the the islands in the bay and watch the waves crashing onto the cliffs. It's special. 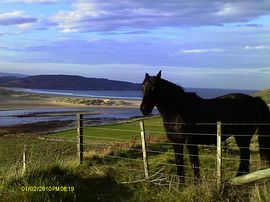 The Bettyhill area is a wonderful place to stay, relax and explore the unbelievably beautiful countryside, designated in 2011 as the 'last great wilderness in Europe'. 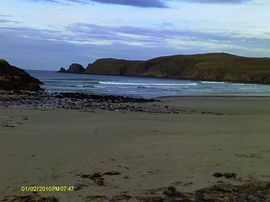 Plenty to do too - hill and forest walks, fishing,surfing, photography, horse riding,cycling, beach combing (the area is close to Sandwood Bay and many other clean, white, sandy beaches. Or just relax in the house with a good book! There aren't any 'do not ....' notices stuck everywhere! Special Diets Provision: Special diets are catered for. Owner is an ex-chef and will happily accommodate special diets. From Tongue - same as above, except reversed! £30 per person, per night, bed and breakfast. Evening meals (depending what's cooking) £12 min. 2 course meal + coffee. Host used to be co-proprietor and chef at Coruisk House Restaurant, Elgol, Skye, which was sold last year.